The Bradford Development formerly known as “Cushing Village”, a mixed use development of residential and retail is located in Cushing Square on the corner of Common Street, Trapelo Road and Belmont Street. The development will include three separate buildings: “The Winslow” located on the site of the old municipal parking lot, “The Pomona” at the corner of Trapelo Rd and Common St, and “The Hyland” at the corner of Common and Belmont Streets. The Bradford Development includes approximately 38,000 square feet of retail space on the ground floor, 112 residential units on the floors above (60 two bedrooms and 55 one bedroom units). Also, there will be 225 parking spaces including 50 municipal spots. The Winslow is located on the site of the former municipal parking lot, and is the smallest of the three buildings. It is anticipated that construction will be completed for this building first. A parking garage and tenant bicycle storage spaces will be housed below grade, with automobile entrance and egress being located at the southern elevation of the Pomona Building (Building 2). The first floor of the Winslow Building consists of approximately 10,200 gross square feet will be divided into smaller spaces to be utilized by smaller commercial establishments such as a coffee shop, a restaurant or other type of local business. Starbucks and a brew pub have signed leases to rent two of the commercial spaces. Both the second and third floors will contain 20 rental apartment units, three of which will be set aside for tenants who qualify for affordable housing. At four stories and 20,000 gross square feet, the Pomona Building is both the tallest and the largest of the three buildings and it will be located at the corner of Trapelo Rd and Common Street. This will be the last building to be constructed, with an anticipated completion date of Fall 2019. 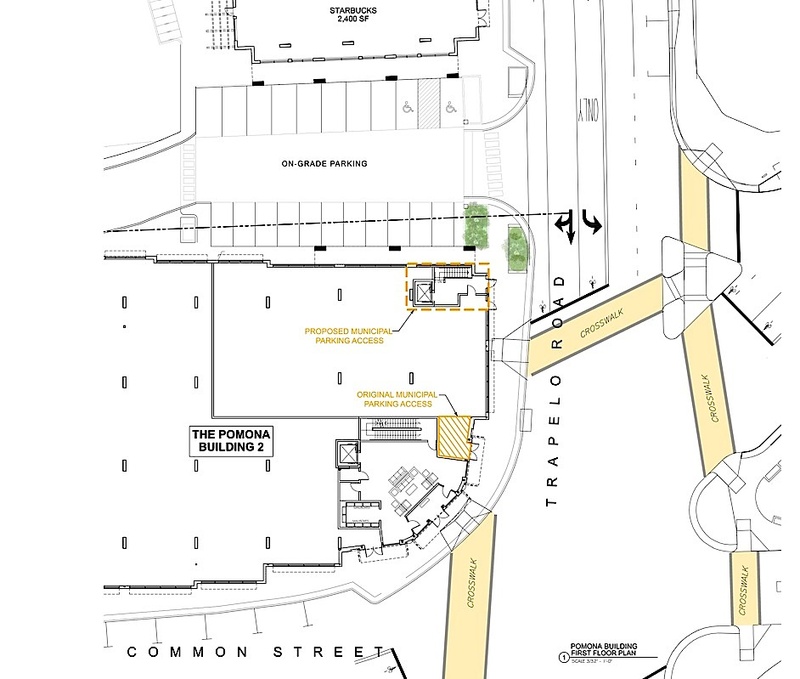 A lobby area at the intersection of Trapelo Road and Common Street will provide access to the underground garage, which will house municipal and residential parking. The first floor, which serves as the commercial level of the Pomona Building, could be leased entirely to a grocery store. 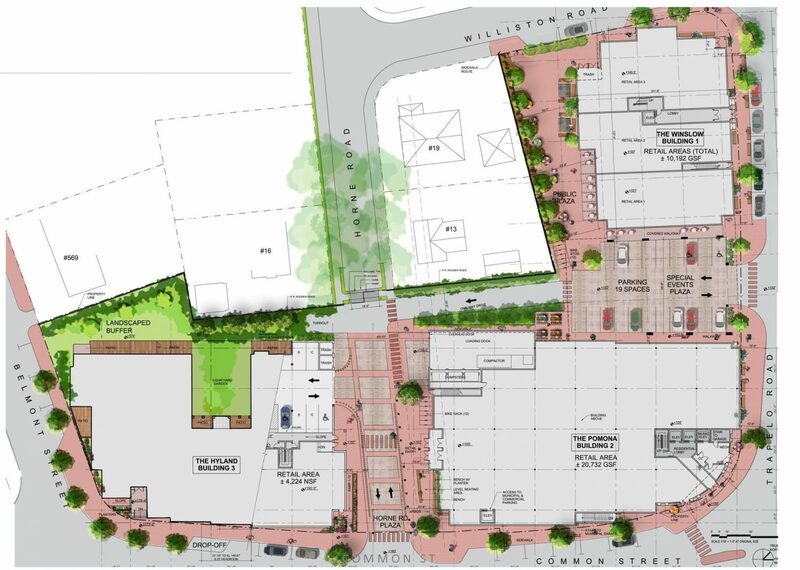 However, while a large anchor tenant is contemplated for the Pomona, nothing precludes this space from being divided into smaller tenant spaces. The second, third, and fourth floors will contain 54 rental apartment units, of which 4 will be set aside for tenants who qualify for Affordable Housing. The Hyland Building will be the second building to come online, and will be located at the corner of Belmont and Common Streets. The topographic constraints at this corner of the site presented a challenge during the building design phase. There is a smaller commercial parking garage below this building that will offer 51 commercial parking spaces. Located directly off of the Horne Road Plaza on the ground floor will be a commercial space of approximately 3,800 gross square feet. In addition to the commercial space located on this floor will be the leasing and fitness centers for the community. The upper floors will contain 38 rental apartments as well as five units set aside for tenants who qualify for Affordable Housing. Serving as an amenity for residents of all three buildings, a roof deck will be located at the top of the Hyland.